440 Gallery is pleased to present Luminous Paradox, new work by Karen Gibbons, a mixed media artist who has shown her work extensively throughout NYC. Ever an artistic explorer, once again Gibbons does not disappoint. This show is a collection of collaged paintings with sculptural sensibilities. Found materials are hinged or bolted together and the artist then builds compositions using images, pastel and paint. Gibbons work hovers in that luminous space between the material and transcendence. Each piece holds contradictory qualities that ultimately speak to the power of paradox: profane and spiritual, obscure and clear, simple and intricate, playful and serious. This new work tends toward the totemic. Although images from nature, childhood, and religious iconography appear and disappear in layers of paint and pastel, focus is on a single overriding shape for each piece: an egg, an animal or symbol. Spirit Donkey is painted on a discarded shipping pallet. The donkey’s form takes up the entire surface and its skin is actually the bare wood of the pallet, complete with scuffs and boot prints. The surrounding color and collage elements conjure the concept of growth through adversity. 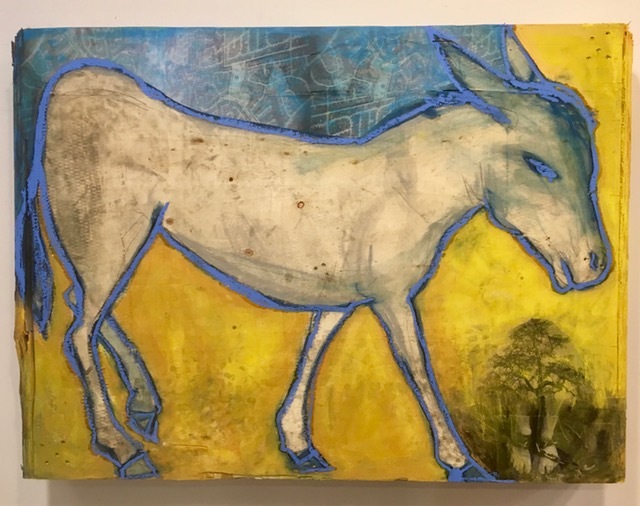 The inclusion (on the pallet’s side pieces) of statements such as “You need to avoid being misused” support the idea of the donkey as a ‘spirit animal’ that may appear when the viewer needs it’s wisdom. Luminous Paradox opens at the 440 Gallery, located at 440 Sixth Avenue in Brooklyn, on Thursday, March 22, and will run through April 22, 2018. There will be a reception for the artist from 5-8 pm on Friday, March 23, 2018. 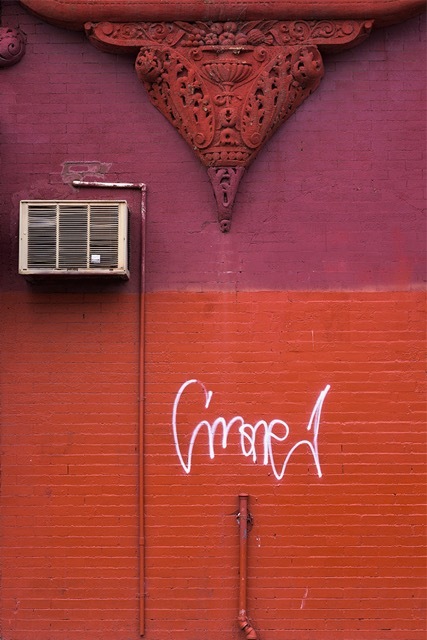 The 440 Gallery is in Park Slope, convenient to the F, M, and R subways. The gallery is open Thursday and Friday, 4:00- 7:00 PM, Saturday and Sunday, 11:00 AM - 7:00 PM, or by appointment. Check the gallery's website, www.440gallery.com, for more information. Leigh Blanchard’s Study #5 (Dried Leaves) is a new series of images created using the process of scanography, or scanner photography. By referencing early photographic techniques, Blanchard uses the vocabulary and imagery of the photogram to create modern digital artworks built around plant life and fabric. Blanchard’s awareness of historical methods versus contemporary applications emerges in Study #5. Traditional photographic themes join modern technology to imbue this work with a level of impermanence and potential reproducibility that is not inherent with legacy photographic methods such as the photogram. Printmaker Gail Flanery is showing work that features monotype printmaking with chine collé—a technique that allows the artist to add color and print on delicate surfaces. Gail approaches her work with a colorist’s concern; the palette is her starting point. Color holds the tonal and lyrical harmony in these images and is used to create a mood and feeling. This new work is experimental: as Flanery explores building up complex compositional configurations, she uses line and shape in unique ways to hold vertical and horizontal divisions.